Taylor Stark took the scenic route to campus – a trip more than halfway across the country on a single wheel. He covered about 3,500 kilometres, did 180 hours in the saddle and completed 1.25 million wheel rotations on his way to Toronto from Vancouver by unicycle. The 23-year-old from Canmore, Alta., will be starting a master's in classics at the University of Toronto, where he graduated with a bachelor's degree in the same subject. He left on a sweltering day in May, which was followed by a torrential downpour the day after. He took only the essentials on his trip: a Swiss army knife, tent, spork and bear repellant, among other things. He also brought ancient Greek and Latin grammar books to study for placement exams in August. He originally planned to ride his custom-made unicycle – that he dubbed Caroline – from coast to coast, but had to cut his trip short because a long winter delayed his departure. He plans to finish the journey to Sydney, N.S., next summer. It goes without saying that the unicycling student turned a few heads along the way. “On the highway you get a ton of honking and hollering,” he says. He stayed with friends, strangers and campgrounds. If all else failed, he pitched a tent in a clearing near the road. He logged his mileage and blogged his thoughts on his site, OneTiredCanadian.com. The trip raised $2,000 for the Canadian Mental Health Association, a cause Stark chose because he has loved ones who have experienced mental health crises. Stark – who took two years off school after graduation – was eager to test his limits in the saddle. 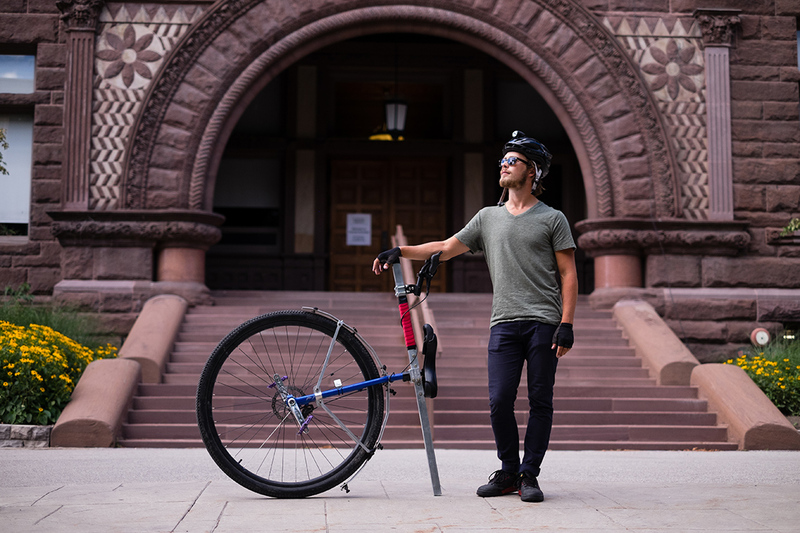 He follows in the tire tracks of his unicycling heroes Kris Holm, a Canadian known as a pioneer of off-road unicycling, and Ed Pratt, a 19-year-old still attempting to unicycle around the globe. Stark fell in love with the sport when he was eight years old, the moment he saw a rusty unicycle in the corner of his friend's yard at a birthday party. “I stopped interacting with anyone at the party and tried to ride it. I couldn't – not one bit. I failed miserably,” he says. Noticing how determined Stark was to learn how to steady himself on one wheel, his dad bought him his first unicycle days later. It wasn't long before Stark could ride up and down his block. Years later, another niche interest – in ancient civilizations, languages and mythologies – led him to U of T.
“I've known since Grade 10 that I wanted to be a professor studying Bronze Age Greece,” he says. He looked at classics programs across Canada and decided U of T's was the best fit. The tour of U of T's downtown Toronto campus – with its old-growth trees and Gothic architecture – also made an impression. He chose to stay in Canada for his master's to study with Assistant Professor Sarah Murray in the department of classics, a specialist in the material culture and institutions of early Greece. The chair of the classics department, Christer Bruun, who's currently in Bulgaria visiting the Roman ruins of Diocletianopolis, says he knows Stark as an A student and former president of the Classics Students' Union. Stark helped organize conferences and launch an undergraduate scholarly journal called Plebeian, Bruun says.